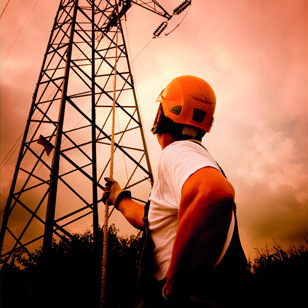 Here in this article we are going to discuss about comparison between overhead lines and underground cables.this also refers to the advantages and disadvantages of overhead power lines and underground cables.In some applications Overhead Lines are useful in some applications Underground Cables are required,hence differences between Overhead Line System and Underground Cable System given below. ground hence area is very compact. number of insulating layers are added to the cable. layers has to be used to provide sufficient insulation. 5.Faults can be detected easily 5.Fault detection is very complicated. 6.Maintenance work is very simple. 6.Maintenance work is very complex. 8.Public safety is less. 8.Public safety is more. communication system. 9.No interference with the communication lines. 11.This system can’t be used near submarine crossings. 11.It can be used near submarine crossings. Following figure shows the general layout of a 3-core underground cable. It basically consists of the following parts. The above parts may vary depending on the operating voltage and the application. Core is the central conductor/conductors which carries the actual current. A cable may have one or more cores depending on the application. It is usually a stranded conductor made up of copper or aluminium. Stranding is done in order to increase current carrying capacity and flexibility. Each core is provided with suitable thickness of I insulation in order to prevent the leakage of current. The thickness of insulation depends on the operating voltage of the cable. Higher the voltage, more will be the thickness of insulation. The most commonly used insulating materials are butyl rubber, impregnated paper, PVC, XPLE, varnished cambric etc. A metallic sheath is provided around the insulation. The sheath is usually made up of lead or aluminium. The function of the metallic sheath is to protect the insulation from direct contact with the soil. This is done because the soil contains moisture and many other chemicals, which will deteriorate the insulation and also may cause some chemical reactions. Bedding is nothing- but a layer of paper tape compounded with fibrous material provided over the metallic sheath. Bedding serves two purpose i.e., it protects the metallic sheath from corrosion due to moisture and it acts as adhesive to stick the metallic sheath and armouring. It also protects the metallic sheath from damages due to armouring. Armouring is provided over bedding in order to provide good mechanical strength to the cable and to protect the cable from injuries during erection. It consists of layers of galvanized steel wire. In order to reduce the sheath loss, the wire is made up of high resistance material.